I have some of you particularly in mind, but even if I don’t know you personally, I’m sure either: a) you have a brilliant story to contribute to this collection, or b) you will want to read it. The notice comes from Iraqi short-story writer and filmmaker Hassan Blasim, who will edit the collection. Comma Press clarifies that the deadline is June 1 and they add that you might want to check with Blasim to see if your city’s been taken. Comma Press is looking for new short stories written by Iraqi writers (currently based in Iraq) to be published in both Arabic (eBook) and English translation (book and eBook) in 2014. The anthology will be edited by Hassan Blasim, and each contribution will be selected according to how well they respond to the following brief: Stories must be set in the year 2103 – exactly 100 years after the invasion of Iraq – and must present visions of how the authors imagine life in particular Iraqi cities might be, in 90 years’ time. Each story must tell a stand-alone drama, a complete human story in less than 6000 words. The culture, politics, technology, architecture, and most importantly the language must all be set firmly in the future however, as well as tied to one particular real-life city. Ten stories will be included, set in ten different Iraqi cities; no city may be featured more than once. There is a list of possible cities to choose from below. If you would like to write for this project, please contact both the organisers via email (hassanblasim[at]gmail[dot]com and ra.page[at]commapress[dot]co[dot]uk) to check if the city hasn’t already been taken. 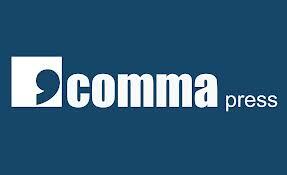 Comma can pay £200 for every story it publishes. However it cannot pay for a story if it does not ultimately publish it. We are not just approaching science-fiction writers (although they aren’t excluded). We feel that it’s just as interesting to ask literary writers to try their hand at something they’ve never considered before (like science fiction). Authors are allowed to be extravagant in their visions of the future, or to use the unfamiliar future setting as a canvas for allegorical comments on contemporary issues. أن تكون القصص مكرسة لعام 2103 أي بعد مرور مائة سنة على غزو العراق ، كما على الكتّاب أن يطرحوا رؤاهم وتصوراتهم عن كيف ستكون ، بعد 90 سنة ، الحياة في مدن عراقية معيّنة. على كل قصة أن تروي دراما مستقلة أي قصة انسانية في أقل من ستة آلاف كلمة. وعن الثقافة والسياسة والتكنولوجيا والمعمار ، والأهم اللغة ، أن تكون كلها على رباط وثيق بالمستقبل وكما رباطها بحياة فعلية لأحدى المدن العراقية. وهذه القصص العشر ستكون مضامينها متعلقة بعشر مدن عراقية مختلفة ، أي ليس هناك قصة لأكثر من مدينة واحدة. وقد أعددنا قائمة بالمدن التي من المقترح اختيارها. للتأكد من أن المدينة التي أخترتها لم يسبق لغيرك أن أختارها. دار ( كوما بريس ) تدفع عن كل قصة منشورة ميلغا قدره 200 باون استرليني وفي كل الأحوال لا تدفع المبلغ عن القصة التي لم تنشر . I think you must give Baghdad more chance because its a very large & the center of the war and culture. Bit isn’t quite a lot of Iraqi fiction focused on Baghdad – it would be good to see perspectives from a wider range of cities perhaps? As Sarah said, it’s nice to encourage representations of other cities. But only 10 stories from all Iraq! We could do another collection, why not. Yes… Well, I’m not affiliated with the project, but I imagine the thinking is: Most Iraqi voices available in English are those Iraqis who live abroad. This is an opportunity for those living in Iraq. It would be great to have another, and another, and many more. Heck, I should organize one. Thanks for the information. I have a question for you. Do you by any chance have a list of Iraqi authors in the United States or Iraqi-American authors in the US? I’m organizing an event here in the US later this year and have been thinking abiut inviting US-based Iraqi/Iraqi-American authors. Let me email you… In case it doesn’t go through, I am mlynxqualey – at- gmail – dot – com. The understanding that so many of us across the globe experience the same suffering, pain, and anxiety regardless of what flag we call our own, is the impetus behind the Iraqi Chronicles Movement. Post Traumatic Stress Disorder [PTSD] is all too often overlooked, misunderstood, or given no true voice…until now. Meet Sgt Denoh Grear, decorated Combat Veteran of the Iraqi War with the United States National Guard, and Wounded Warrior living with and healing from Post Traumatic Stress Disorder [PTSD]. Denoh was exposed to devastating violence in his youth, including civil wars in Sierra Leone and Liberia, the respective birthplaces of his mother and father. These experiences were influential in his decision to enlist in the Massachusetts National Guard in 1999. While serving, Sgt Grear came face to face with many of the horrors of war – not unlike millions of other soldiers and citizens all over the world. He developed PTSD and upon his return to the United States began transitioning through the Wounded Warrior Program in Washington, DC. The healing process is different for everyone and rarely does one form of treatment rapidly and completely alleviate all PTSD symptoms. For Denoh, complete participation in the Wounded Warrior Project is just the beginning. While serving in the Middle East, Denoh chronicled his journey in great detail. Writing poems, prose, and song lyrics served as an anchor, a way to stay grounded and to record his experiences. Stateside, Denoh took his body of work to the next level by recording songs, performing poetry-slams, and publishing his poetry. He uses all forms of self-expression to work through PTSD, instead of letting trigger-experiences control him. Still, his search for additional support led him onward, and he began investigating lesser known or perhaps less funded areas of research such as Transcendental Meditation [TM] through the David Lynch Foundation. He is presently a Spokesperson for Operation Warrior Wellness. With estimates of people suffering from PTSD at an all time high, Denoh founded Iraqi Chronicles to voice the movement toward wellness, not just for soldiers but for all in need of a well-lit path. There IS help. There ARE multiple ways to cope and often to heal. Join Denoh Grear as he transitions from combat to a Wounded Healer, leaving no rock unturned in his journey to heal himself and present his multimedia pieces to help heal the world.